Straight Edge Precision provides simple solutions for complicated water management issues. We supply the control systems, planning solutions and even guidance solutions to allow you to maximize the returns from your land with the least impact on your pocketbook. By using Android tablets to control Ditch Assist, we offer a low cost screen ($300 to $600 compared to $4000) that is multi-purpose. Google Play automatically updates your tablet to the latest software as soon as we post it so you never have to worry about old software. The original system was designed to do straight lines and single grades, much like a laser system. Now with Slope-IQ we can create best-fit plans to reduce the amount of soil dug by up to 60%! Curves are no problem at all either, making any ditch or terrace clean-up simple. Ditch Assist can also grade to an elevation, handy when making bin pads or needing to remove a known depth of soil. The complete system is easy to setup, learn and use. The interface is simple and intuitive, acting like many other apps you use everyday. Most systems are installed in a few hours and you can be up and working in a day. Thanks to the wifi connection between the tablet and control module many systems don’t require any wires going into the cab. This makes it easy to move the system between tractors or implements with little hassle. Whether you have new and old tractors, closed or open center hydraulics, Ditch Assist will work with them all. We have made cables that connect to most major AG GPS systems on the market. As long as the system exports NMEA signals, Ditch Assist can use them to control your equipment. It’s easy to create ditches in the field with the built in survey function. Ditch Assist can also download field leveling plans to allow for more intensive drainage plans. For more details visit: ditchassist.com. Ditch Assist X combines GPS and angle sensing technology to compute accurate bucket elevation at any position. Use the Ditch Assist app in the cab to guide you while digging to grade and eliminate lasers! No need to learn new software. Keep using a simple Android tablet as a monitor to save on costs and keep getting free updates from Google Play. Users can pre-survey areas to create multi-plane slopes which will reduce digging times when cleaning ditches. It’s also simple to just start a single slope ditch anywhere. Users love how simple Ditch Assist is to set up and use. The learning curve is very short. Works with nearly any GPS system. You can use your current GPS antennas with the system so no extra costs needed. Laying pipe and building drains requires planning and precision, and the control to match. GCS: Pipe brings the accuracy of a surveyor and the expertise of an engineer into your operators cab. Using GCS:Pipe©, you can lay pipe exactly to plan, map your progress, and then provide accurate data to your customer proving the quality of your work. In the event a section of pipe requires maintenance, your pipe is now easy to find – no exploratory digging required. Build curved and straight paths easily. Calculate the best invert fit for every tile line installed to contractor specifications: minimum and maximum slope, desired optimum tile depth, and others. When using a laser exclusively for position, depth can be controlled even if the grade of the laser is the opposite of the pass. Correct course as necessary – Real pass and planned pass are displayed together graphically on screen. Minimum depth, maximum depth, or ideal depth are displayed graphically on screen before and during installation. 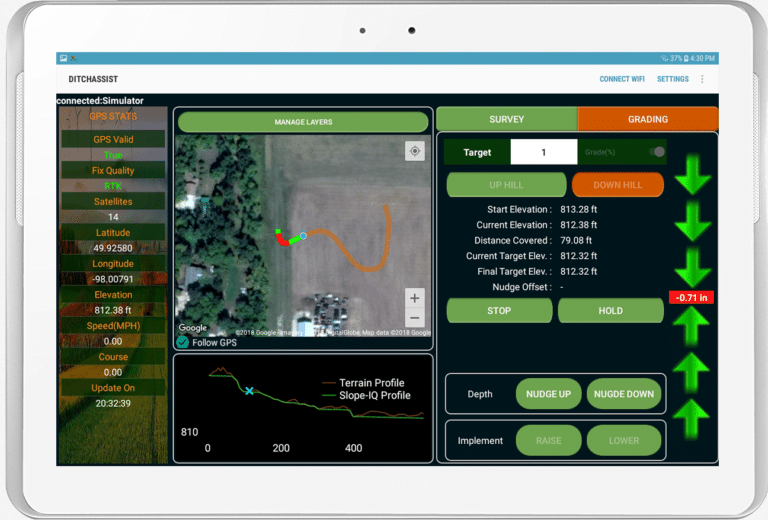 Make Manual operator adjustments without deviating from the plan, with automatic software compensation that allows you flexibility while keeping the operator on-target. Export/import data easily to/from most civil and survey CAD programs. For more details visit: gcs3d.com.